It’s been almost a month since the 2011/2012 TV season ended, giving me enough time to catch up on some of the shows and finally watch their season finales. I thought when this season started that there weren’t going to be any new good shows; most of the trailers at the time didn’t seem that interesting and a lot of the pilot episodes just didn’t catch my eye. Looking back now though I have to admit it was an okay season for new shows, especially the more girly ones! I tend to have a short-list of shows I’ll watch straight away and shows that will go on the back burner for when I’ve run out of the “good” stuff (or keep them for during summer). And some of the new shows went straight to the top of my short-list (some of them it took a while to get into, others are still on the back burner). My only complaint: we need more scifi on TV! Btw, all the shows I’m reviewing here have been picked up for the next season. Yay! The only show that I was really watching that didn’t get picked up was Terra Nova which I have to admit wasn’t that great (it had a lot of potential though). There are also some new shows that I’m skipping here (like Touch and Grimm), cause I just haven’t had the time to watch those yet. This post turned out to be quite long, so I’ve split it up into two parts. Come back tomorrow for my thoughts on Revenge, The Legend of Korra, New Girl, 2 Broke Girls, Scandal and Continuum. Plot: What if a machine existed that could analyze all CCTV footage, all phone calls, all transactions, all online activity and based off of these could predict when crimes happened? If you can suspend your belief of such a machine existing, Person of Interest is a great show. Each episode the “machine” provides our main characters with the social security number of someone who will be involved in a crime, but they don’t know whether this person will be the victim or the perpetrator. It’s a good setup for a procedural “crime-of-the-week” show and could have easily gone the wrong way of procedurals, but Person of Interest stays interesting by adding two mysterious protagonists and a couple of intriguing season story arches. It’s produced by JJ Abrams and created by Jonathan Nolan, so that should tell you how twisty and mysterious this will get. 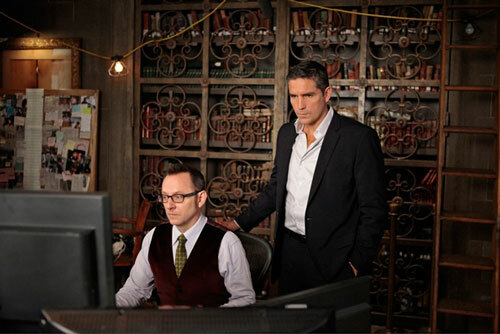 Michael Emerson (Ben in Lost) plays Harold Finch, the software genius that created the machine, and Jim Caviezel plays John Reese, the ex soldier with a very shady past. I love the banter between these two, and as the season progresses you find out more and more about both of them. While the actual technology behind the machine seems unlikely and glossed over at times (just the amount of processing power needed to do what the machine does is even now still unthinkable), I find the show does handle the consequences of dealing with such a machine in the right way. Plot: Behind the scenes of creating a musical about Marilyn Monroe. What do you get if you add Steven Spielberg, the composer and lyricist of Hairspray and a bunch of Broadway and Hollywood actors? Smash. The show is about all the people involved in getting a Broadway musical off the ground: Julia (Debra Messing), the lyricist, and her writing partner/composer, Tom (Christian Borle); Derek (Jack Davenport), the annoying director; Eileen (Anjelica Houston), the producer; and the two contenders for the role of Marilyn, small town girl and newbie Karen (Katherine McPhee) and, seasoned Broadway performer, Ivy (Megan Hilty). What I love about is Smash is how it actually is creating new songs for a potentially new musical. There are some awesome numbers in the first season, and throughout the season I kept wishing I could see this musical on stage. The weakness of the show though is clearly in its storytelling; while the main thread of creating the musical is interesting and handled right, there are a couple of side stories and accompanying dialogue that feels awkward. Next season though there will be another show runner so hopefully those problems will be fixed soon. Plot: Half fairy tale fantasy, half modern day drama. It took me a few episodes to get into Once Upon A Time. At first glance it looks like a flaky fantasy show with a not that great visual effects budget, but after a while the story reels you right in with its balance of fairy tale fantasy and real word drama. The show is about Emma Swan (Jennifer Morrison) whose biological son Henry (Jared S. Gilmore) claims that his adoptive mother Regina Mills (Lana Parilla) is the Evil Queen and has bewitched the entire village of Storybrooke. Besides that story though half the episodes also take place in the fairy tale world, showing reinterpretations of classic tales like Snow White, Red Riding Hood, and more. I love the balance of those two worlds, and I think it’s because of that balance that the show never feels too cheesy. As the story progresses, we get to see more and more of the background of the fairy tale characters and I like how they’ve twisted and merged some of those stories into something completely new. While some episodes can be a tad predictable, I’ve been more often than not surprised by which direction they’ve taken it; it’s a show that keeps you guessing about where it’s going, and I can’t wait to see what’s next. I also love love love the costume design and styling on this show. The gowns and costumes the Evil Queen and the other fairy tale characters wear are amazing; some of them are just so gorgeous! Next to that the makeup and hair styling is always spot on; I really want a dark evil red lipstick that I can pull off. Plot: A big city surgeon inherits a small town practice in Bluebell, Alabama. Hart of Dixie is one of my favourite new girly TV shows. Take Summer from The O.C. (Rachel Bilson), mix in a Gilmore Girls-esque picturesque town, and a pinch of quirky and quick dialogue. Rachel Bilson is adorable as Doctor Zoe Hart, and while I have a bit of a hard time believing her as a doctor, she’s great as the girl trying to fit into a new town. The show does feel a lot like a newer Gilmore Girls, with the town having every other week yet another quirky event (like the annual Bluebell gumbo competition or the annual Sweetie Pie Dance). Plot: A foster care system girl finds out she has a twin sister, who got adopted into a wealthy family. They switch places so that the rich girl can track down their birth mother. The Lying Game is what I was hoping Ringer would be. Two sisters: one bitchy and rich girl, who takes her family and money for granted, and the poor little foster care girl, who now has a chance to experience a family. It’s as soapy as can be, but I like it anyway. Here at least you can’t help but feel for the main character Emma, when she gets into trouble cause of what her bitchy twin Sutton has done in the past (unlike in other soapy shows where you just can’t empathise with a character because of something stupid they themselves have done). I thought this show’s first season had ended, but it turns out it got an extra 8 episodes that just started last week! It’s another girly teen drama, with loads of mix-ups, sneaking about and high school romances. Jane is a bit of a quirky outcast at school that accidentally gets mistaken for an adult when interviewing for an intern role at a fashion design house. She ends up landing the job as the personal assistant to Gray (Andie MacDowell), but struggles with juggling her high school life and work life. It’s a fun show, and it’s great following Jane discover the world of fashion. As expected the styling in this show is awesome; there are so many dresses I so want to have (most of the times the ones that India is wearing)!